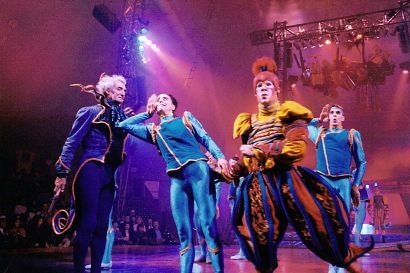 Cirque du Soleil is credited by many, including Harvard Business School's Youngme Moon, with reinventing the concept of circus. In her brilliantly insightful book, Different: Escaping the Competitive Herd, Harvard Business Professor Youngme Moon recalls the teacher’s advice regarding what she should send with her children on their first day of kindergarten: a favorite stuffed animal, blanket or toy — any familiar object that blunted the effects of the newness and uncertainty that awaited them. This advice ended up serendipitously reinforcing what later provided to be a critical insight of her book. During those occasional disruptive periods of life, we prefer the newness of our altered circumstances to be anchored as much as possible by familiarity — sameness — but in our day-to-day living, we like our monochrome sameness to be occasionally embellished by flashes of newness. Indeed, Moon contends this passion for a sameness sporadically punctuated by eruptions of newness is an innate desire that defines the sum of human existence. Therein lies a critical branding lesson: The most successful enterprises in the future will be those who produce the optimal amount of difference by striking the right balance between sameness and newness. I finished the last page of Moon’s book more convinced than ever that striking this balance will be the central preoccupation for public and private entities in the 21st century. Extension will prove no exception — something of which I was reminded last night reading an especially incisive post on the Cooperative Extension System Facebook page. As the poster observes, funding shortfalls are already forcing Extension to do more with less, namely less staff. Sooner or later, these shortfalls, along with other social and economic factors, will force Extension to reevaluate what it does — or, more specifically, what it can and can no longer do. In other words, it will call for the formulation of a new organizational focus. That raises the obvious question: What should that focus be? For some, it’s a scary question. For others, including yours truly, it’s a question that conceivably presents us with one of the greatest opportunities in our history — at least, if we view this challenge not as the severing of a limb but as an opportunity not only to redefine ourselves but also to differentiate ourselves in a meaningful and lasting way from our competitors. As I see it, this challenge — redefining and differentiating ourselves — brings us back to what Moon perceives as the sum of human existence: striking the right balance between sameness and newness. She cites a number of private companies that have risen to this challenge and succeeded spectacularly. One especially noteworthy example is Cirque du Soleil. As Moon and countless others contend, Cirque du Soleil has redefined the whole concept of circus. As counterintuitive as it seems, they have succeeded by eliminating much of what has traditionally been associated with circuses — dusty air, prancing animals and ringmasters — and substituting something entirely new, namely elements of dance, theater, music and gymnastics. Among some critics, Cirque du Soleil, by eliminating the usual features of circuses, no longer qualifies as a circus. But as Moon contends, that’s precisely the basis of Cirque du Soleil’s genius: there’s a certain “seditious advantage” in positioning oneself as a circus while venturing beyond stereotype. I think the times present Cooperative Extension with a similar opportunity for sedition — creative sedition — an opportunity to position itself within the category of government/university outreach agency while venturing beyond stereotype. This raises the inevitable question: What form should this transformation take? How much newness do we introduce? How much sameness do we retain? Here’s another way of considering it: What Extension versions of dance, theater, music and gymnastics will we employ to replace the dusty air, prancing animals and ringmasters? Rest assured that I’m formulating some answers to these questions that I’ll share in an upcoming post.